The secret’s out. 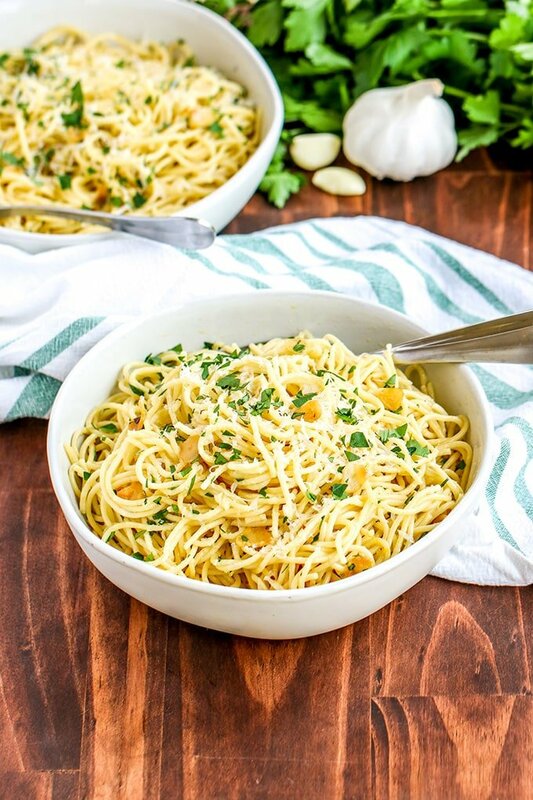 Even though Spaghetti Aglio e Olio looks fancy, it’s the easiest pasta dish you’ll ever get on the table. Sometimes simple is best but using quality ingredients is key. When you use quality ingredients, you don’t need to overdo it and that’s exactly why this Spaghetti Aglio e Olio is so amazing. It translates to Pasta in Garlic and Oil and that’s essentially all there is to it. Adding a couple seasonings, like red pepper flakes, salt and lemon zest, really enhances the two main flavors – garlic and a good olive oil. You’ll have dinner on the table in no time. The key with this dish is to heat the olive oil and garlic slowly so the garlic doesn’t burn. 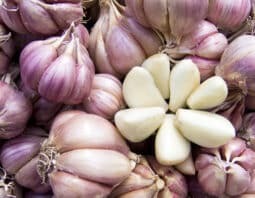 Once the garlic is too brown, it tastes bitter which can leach into the olive oil flavor itself. 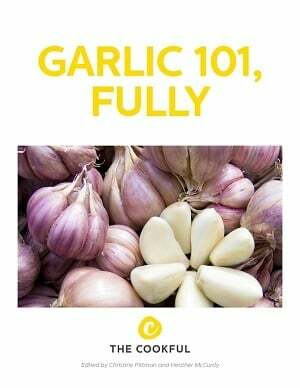 Taking some extra time to cook it slowly to avoid burning the garlic will give you that perfect taste. Or if you want to change things up, try adding some roasted garlic, which you can easily make following our steps in how to roast garlic. Another trick I use helps the sauce coat the pasta perfectly – use pasta water in the sauce. First, salting the water when the pasta is cooking helps flavor the pasta even more. The pasta will gain some of the flavor as it cooks then it releases some of the starch. The starch and salt from the pasta water helps the sauce both thicken and stick to the pasta itself. I recommend adding the pasta to the oil first and coating it then mixing in the water so you don’t have that dangerous reaction of adding water to hot oil. Be sure to save this recipe to your favorites because you’ll use it often – whether surprise guests pop in or you simply need dinner on the table in a hurry. 1 lemon, zested, about 1/2 Tbsp. In a large pot, bring water and 1 tablespoon of the salt to boil. Add spaghetti and cook for 9 minutes, until al dente. Reserve 1 cup of pasta water, then drain. Using the same pot, add olive oil and sliced garlic cloves to the pot and heat over medium low heat. Cook for 8-10 minutes until the garlic cloves are lightly browned. Add in salt and red pepper flakes and cook an additional 1-2 minutes. Lower heat to low and add in pasta and toss until coated. 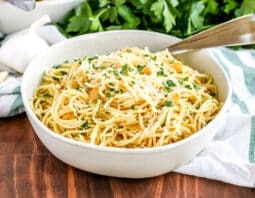 Pour in 1/2 cup of the reserved pasta water, lemon zest, grated Parmesan, and diced parsley and toss until incorporated. Add in additional pasta water, if needed. Serve into bowls and top with additional Parmesan and parsley, if desired.